The G4 Series Offset Cage offers another level of safety with an extra lower tapered railing. It arrives fully assembled and features flared and tapered rungs that give the lid a full range of motion while the equipment is in the working position. The design also ensures that the gangway and cage won’t have any interference when the equipment is lowered on top of the truck. Increase Vehicle Protection – With rubber bumpers at gangway / vehicle contact point. Loading and unloading cement presents a unique set of challenges and risks. Typically, cement truck loading requires three stops, increasing the risk of human error threefold. To make matters worse, many workers, to account for trucks that are spotted incorrectly, attempt to lift the entire cage while atop those trucks. Company policies can only do so much to protect your workers and your business. However, with the new G4 Series Offset Cage, your employees—and bottom line—are more protected than ever. The innovative cage, designed specifically for the cement industry, features a lockdown device that allows workers to lift the gangway only when safely on the platform and while pressing the footlock assembly. The G4 Series Offset Cage features flared and tapered rungs that give the lid a full range of motion while the equipment is in the working position. The design also ensures that the gangway and cage won't have any interference when the equipment is lowered on top of the truck. 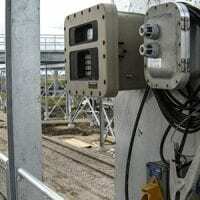 It's designed to be used with both SFR and SAS gangways and can be offset to either the left or the right. And, like all SafeRack products, it's built with safety and longevity in mind. The heavy-duty aluminum withstands whatever your job or Mother Nature can dish out. Plus, the three rails on both ends, along with four rails at the hatch area, provide a sturdy and secure workspace. Additionally, it's large, 4'x7' handrail footprint allows workers the room they need to stay productive. Safety is locked in. 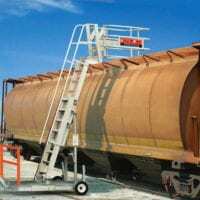 For operators in the field, it’s becoming a common practice to raise and reposition gangways from the top of railcars or trucks when the hatch interferes. This extremely dangerous habit has increased the risk of operator falls. With the G4 Gangway/Cage Lock-down Assembly, your gangway stays securely in place at all times. Only when the operator returns to the platform can they release the lock, keeping the gangway from being raised until they’re safely out of the work area. Cement cage designed to close gaps between truck tops and safety cage. All positive experiences! Even my customer agreed! My salesman Joe Free was fantastic, he was incredibly responsive & was very honest with me when it came to what my customer really needed for their application. As I could not be there for the on-site visit – my customer was drawn to a new unit from SafeRack as they already had a unit they were using & liked, recommended by their safety manager, lead times were short & installation is easy!